Self-watering planters make life easy for busy gardeners. Southern Patio’s easy-to-use insert converts most planters to self-watering. 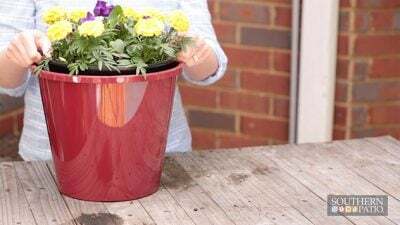 It fits a range of planter sizes, 10-inches to 18-inches in diameter, and shapes to help prevent over watering. The self-watering insert is simple to use. Just add a layer of soil in the bottom of your planter and place the insert on top. Then, pot the plant as normal. Water your plant from the top for the first week, then refill the insert’s reservoir with the tube from then on. The reservoir provides roots just the right amount of water, and the rope wicks water to surrounding roots.